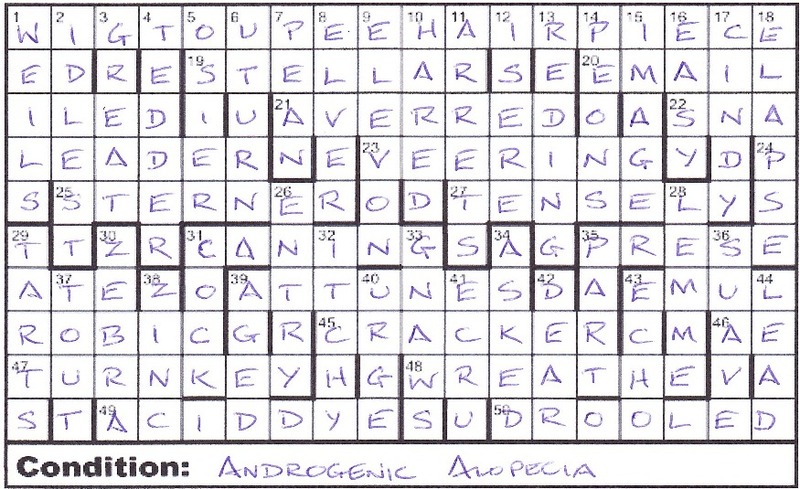 Across clues were normal, as were the upper down clues which had to be enetered jumble-wise. The lower down clues had an extra letter which needed to be moved to the top row transforming it from a jumble to a real word; I liked that idea. I was fairly slow solving the acrosses (just half a dozen) and decided to tackle the Lower Down clues next which were listed separately from the Upper Downs (thanks, Serpent). I was a bit worried when I got to 29 Initially thin people disliked pastry dishes (5) where I suspected that F was the extra letter, referring to old [F]ARTS in the wordplay! It turned out to be [W]ARTS. After about 50 minutes, I had what looked as though it could be WAG TO UPPER EARPIECE in the top row. A bit more concentration, and a smile broke out as I realised that WIG TOUPEE HARIPIECE were likely to be the three words required. My first guess at the condition was FOLLICLY- [Wrong spelling. Ed.] CHALLENGED. Having the top row in place certainly helped with the remaining Lower Down entries, but it still took nearly 90 minutes to fill the rest of the grid. I particularly liked the clue to 4 Number: band regularly does covers? (6) for DEADER, although I wasn’t sure why there was a question mark. I also thought that it was a shame that the amusing 28 Informal request, the same in French (5) LEM[E]ME wasn’t in Chambers. The condition was finally revealed as ANDROGENIC ALOPECIA which isn’t in C, although male pattern baldness is. Thanks for a very entertaining puzzle, Serpent, and thanks also for smile number two — the title! This entry was posted on 4 August 2017 at 4:00 pm	and is filed under Solving Blogs. Tagged: Serpent, Shock Therapy. You can follow any responses to this entry through the RSS 2.0 feed. You can leave a response, or trackback from your own site.